Will a New Siting Commission Placate Big Wind Opponents? Breaking news! 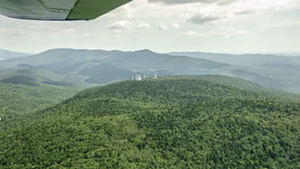 Apparently some Vermonters are ticked off about the way new electrical generation projects — think wind turbines and solar farms — are sited, permitted and approved. Opponents to proposed renewable energy projects projects in the state — such as a solar farm in Charlotte, or the contentious Kingdom Community Wind project under construction at Lowell — have complained that the current process for reviewing these projects is highly technical, expensive, and unfriendly to neighbors. Right now, new electrical generation facilities are approved by the Vermont Public Service Board in a quasi-judicial process heavy on expert testimony. But here's the twist: In an apparent concession to this growing drumbeat of opposition, Gov. Peter Shumlin this week issued an executive order creating a new, five-person commission to study the way new electrical generation projects are sited, reviewed and approved — and to propose some possible improvements. VTDigger.org's Andrew Stein has more details on the story, and Free Press reporter Candace Page has a thorough round-up of reactions from around the state. The five-person commission is charged with analyzing the way the state currently approves these projects, looking to other New England states for alternatives, and ultimately proposing recommendations by April 30, 2013 for ways to improve Vermont's system. Stein reports that the commission was formed, in part, to update "an outdated model of permitting energy generators," adding the number of annual applications for these permits has more than doubled over the last 10 years. Interestingly, it's no longer just neighbors complaining about the PSB approach to evaluating new projects. Shumlin's order comes after six environmental groups — Audubon Vermont, the Green Mountain Club, the Vermont chapter of the Nature Conservancy, the Vermont Land Trust, the Vermont League of Conservation Voters and the Vermont Natural Resources Council — penned a letter to Shumlin encouraging the formation of a new commission. In the letter, representatives from these organizations say that the debate over wind energy in particular in Vermont has "unnecessarily divided" friends, families and towns, and say the current process for siting wind projects lacks "both long-term vision and consistency." Will Wiquist, the director of the Green Mountain Club, says the club has been involved in the PSB hearings for wind developments in Lowell and Deerfield. He says the process is expensive and relies heavily on outside experts, but notes that one of his primary concerns is that the PSB process takes projects on a case-by-case basis instead of considering the big picture. "We've been concerned for awhile, at least the last few years, that a lot of these siting decisions are made in a bubble," he says. It's too soon to say whether or not the commission itself will placate outspoken opponents of ridgeline wind development. Steve Wright of Craftsbury says he wants to be optimistic, but realistically is taking a "wait and see" approach. "We don't know what the process is," he says. "We have no idea where this particular group is philosophically." In a best case scenario, he says, he hopes to see the commission undertake an approach in the coming months that is "as open and transparent as humanly possible, that will include as many viewpoints as are available." "I'm not yet convinced, so convince me," says Wright. File photo of a Sheffield, Vt., wind turbine, by Kathryn Flagg.